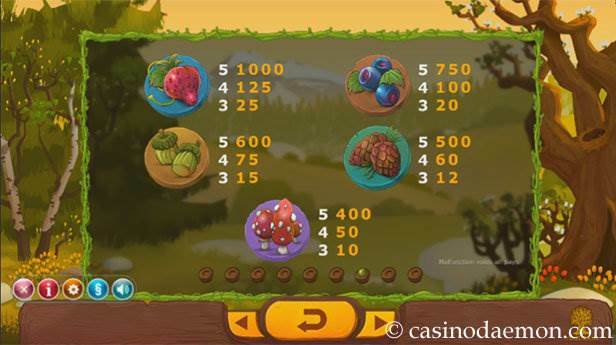 The Seasons slot is the perfect game for nature and animal lovers, and it gives a nice impression of the four seasons that change while you are playing the slot. Each season comes with its own special feature. The symbols show pictures of berries, mushrooms and other forest fruit, as well as card suit symbols in a leafy design and animals as the special wild symbols. The music accompanies the game with a fantasy-type nature music and sound effects. What makes this game interesting are the four different seasonal features that affect your potential winnings, and you can also trigger free spins. The variance of the game is medium, and you should regularly win smaller amounts, as well as the occasional larger amount. The seasonal wild features can also give you some nice winnings, but most money can usually be won during the free spins. The theoretical return to player is 96.1%, which is average for an online slot and in line with other slots from Yggdrasil. You can also play Seasons mobile on many different devices, as the game is optimised in HTML5. You can try the demo version of the game and play Seasons for free here. If you like the game and want to play it for real money, you can find it at one of the online casinos listed on this page. 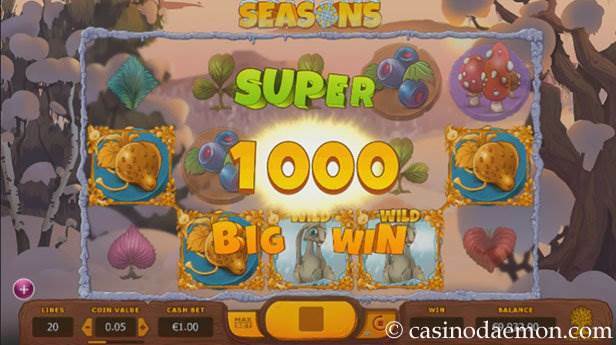 The most interesting thing about this slot are the four different seasonal wild features. The seasons change every 10 spins and a random season is chosen next. Winter: the Hare Wild can duplicate itself onto another position on the screen and it will be the position that gives the highest possible win. Spring: the Owl wild gives free re-spins. During the re-spin it will move on to another position that is randomly chosen but adjacent to the previous position either horizontally, vertically or diagonally. Once the owl moves off the screen it will disappear. The re-spins continue until there are no further Owl Wilds on the screen. Summer: the Deer Wild expands into a cross-pattern into up to 5 symbols. Each additional wild symbol is placed left, right, above and below the original Deer Wild. 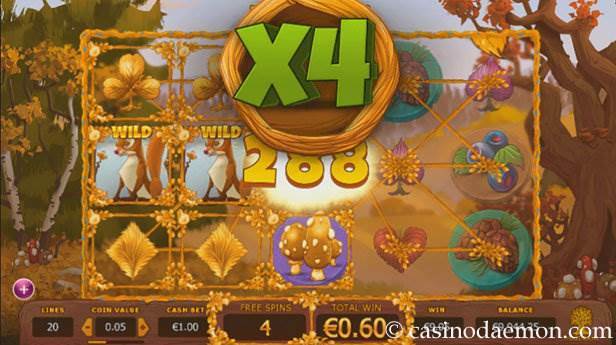 Autumn: The Fox Wild has a multiplier that is going to be applied to all winnings of the spin during which it appeared. The more wild symbols are on the screen, the higher the multiplier. The multipliers can be between x2 and x10, depending on the amount of wild symbols. You can also trigger free spins with at least three free spins symbols anywhere on the screen. You can get 7, 15 or 30 free spins for 3, 4 or 5 free spins symbols. The free spins are played in the same season that triggered it, and it is even more likely to get wild symbols during the free spins. 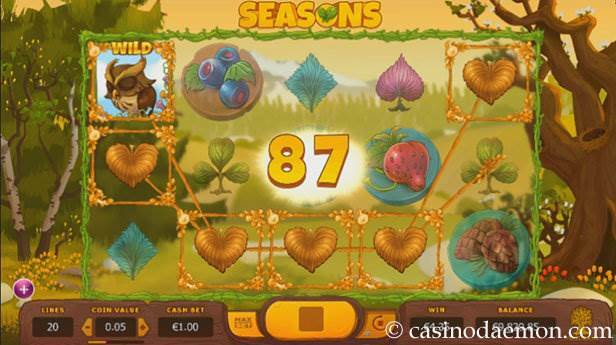 The Seasons slot has 5 reels with 20 fixed pay-lines. You can play the game with coin values between 0.01 and 5 £/$/€, which means the minimum you have to bet in one round is 0.20 £/$/€, and you can raise your stake up to 100 £/$/€ per spin. It is also possible to select automatic play options.